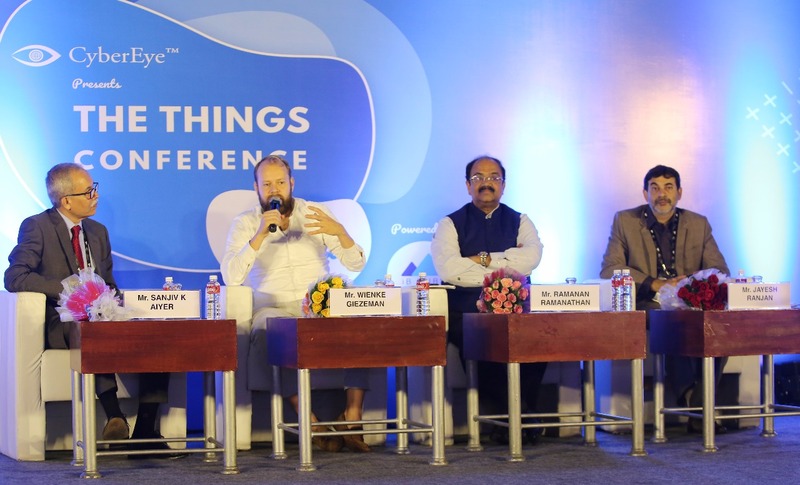 ‘The Things Conference India’, happening for the first time in India, has kick-started at HICC, Hyderabad today. The 2 day conference happening on 9th-10th of November witnessed global technology leaders, governments, technology experts, academia, research organisations and industrialists who came together to discuss the immense possibilities with IoT & LoRaWAN. These technologies can drive India towards building Smart Cities in a cost-efficient and effective way. The event is presented by CyberEye, a technology company with a vision to build a smart and secure world. CyberEye is supported end-to-end by iB Hubs. The conference, happening for the first time in Asia, witnessed Mr. Jayesh Ranjan, Principal Secretary – IT, Govt. of Telangana, Shri. Ramanan Ramanathan, Mission Director – Atal Innovation Mission, Shri. Karuna Gopal, President of Foundation for Futuristic Cities, and other leaders who play a key role in developing India into a smart nation. 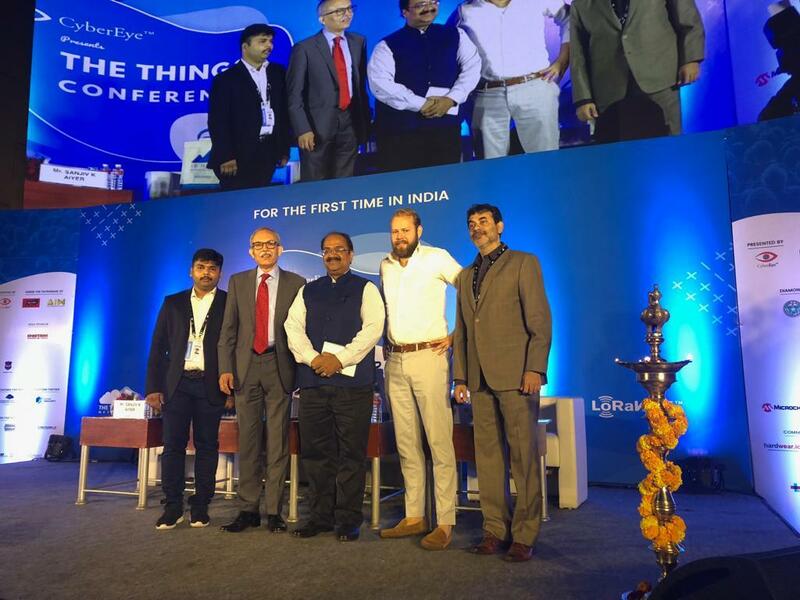 Global leaders in IoT and LoRaWAN such as Mr. Wienke Giezeman, CEO & Co-founder, The Things Industries and Mr. Johan Stokking, CTO & C​o-founder, The Things Network, ​Mr. 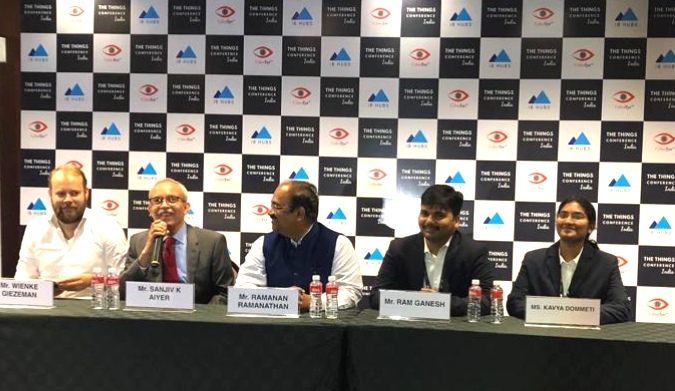 Prasad Kandikonda, Vice President Of Software Engineering at Multi-Tech Systems, Inc., Mr. Sanjiv K Aiyar, Group Advisor and Board Member, iB Hubs have graced the conference. Smart and connected cities will bring substantial improvements in the urban way of life that would effect 1⁄3 of the Indian population. Smart cities also affect the core infrastructure elements like solid waste and energy management, efficient urban mobility and public transport. This will give way to a robust and sustainable e-governance. “Through ‘The Things Conference India’, we have set up a platform for people to come and discuss problems and bring out solutions. We are excited to take this disruptive technology forward in India. We are committed to build tech communities across the country and together, we will realise the vision of a Smart & Secure India. I’d like to thank everyone for supporting and boosting the conference. iB Hubs has been supporting us end-to-end throughout the journey since our inception. Without their unending support ‘The Things Conference India’ wouldn’t be possible. ” Ram added. CyberEye is a technology company with a vision to build a smart and secure world. CyberEye is on a mission to build cutting-edge technologies which impact billions. With a determination to build an army of hackers and makers, CyberEye has trained more than 2500 professionals, scientists, state and central defence personnel, faculty and students. CyberEye is also a member of The LoRa Alliance, an SIG (Special Interest Group) Member of NASSCOM on Cyber Security, a member of Data Security Council of India (DSCI) and many more. CyberEye is end-to-end supported by iB Hubs. iB Hubs is a PAN India startup hub, that provides end-to-end assistance to startups. Within 2 years of launch, iB Hubs has supported 100+ startups, and has given 25,000+ trainings in entrepreneurship and emerging technologies. With a strong foothold across 60+ countries, iB Hubs established 45 hubs across the globe. To nurture the culture of innovation and entrepreneurship in every nook and corner of India, iB Hubs is planning to set up 2500 hubs across India by the end of 2019. ● LoRaWAN is a Low Power, Long Range Wide Area Network technology. It enables sending small packets of data over very long ranges with extremely low cost and low power requirement. ○ Both the points together, this technology cuts down the costs involved multi-fold. ● Hence, LoRaWAN offers many advantages in building smart cities and smart nations.